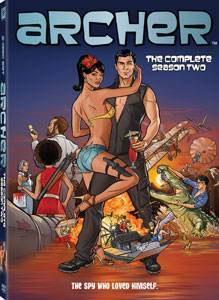 Archer: The Complete Season Two Is A fun tongue in cheek comedy with an adult theme. All you Archer lovers take heed, now on Blu-ray Archer: The Complete Season Two with every minute of the hilarious spy spoof unencumbered by those pesky commercials. If you think season one was crude, you can bet the second season has more wild and wacky episodes that could embarrass a drunken sailor. Archer is an adult animated, half-hour comedy that revolves around the International Secret Intelligence Service (ISIS) and the lives of its employees. Although their work of espionage, reconnaissance missions, wiretapping and undercover surveillance is daunting and dangerous, every covert operation and global crisis is actually just another excuse for the ISIS staff to undermine, sabotage and betray each other for personal gain. The series features the voices of H. Jon Benjamin as the highly skilled and incredibly vain master spy, Sterling Archer; Aisha Tyler as Archer's fellow agent and ex-girlfriend, Lana Kane; Jessica Walter as Archer's domineering mother and the director of ISIS, Malory Archer; Chris Parnell as the easily intimidated comptroller-turned-ISIS-agent, Cyril Figgis; Judy Greer as Malory's loquacious secretary, Cheryl Tunt; Amber Nash as the discordant director of human resources for ISIS, Pam Poovey; Adam Reed (Creator & Executive Producer of the show) as the outspoken explosive expert, Agent Ray Gillette; Lucky Yates as ISIS's possibly mad scientist, Krieger; and George Coe as Archer's elderly and always exploited butler, Woodhouse. The thirteen episodes have the following titles Swiss Miss, A Going Concern, Blood Test, Pipeline Fever, The Double Duce, Tragical History, Movie Star, Stage Two, Placebo Effect, El Secuestro, Jeu Monegasque, White Nights and the season finale Double Trouble. It is hard to choose a favorite, but I just want to throw out the hilarious Stage Two to you as a showstopper. The Blu-ray disc has some fun Bonus Features starting with "Archersaurus- Self Extinction" a funny short starring a dinosaur in the lead role; "Ask Archer" has Archer answering questions like a Dear Abby; "Semper Fi" is a mock shout out to the troops in Afghanistan; and "L'espion Mal Fait" comes across like an roast of super spy Sterling Archer. But the best of the bonuses comes with "ISIS Infiltrates Comic-con" were we get to meet the principle cast of Archer and here their replies from questions asked by fans from the audience. I didn't have my Blu-ray player hooked up to my computer so I was not able to review the Live Bonus features that are available through the disc. I'm one of those that want to know the performance of the product I purchase so here are the technical aspects of Archer, Season Two, on 2 disc Blu-ray. The Format: AC-3, Animated, DTS Surround Sound, Subtitles for the hearing impaired, Widescreen, in English with French and Spanish Subtitles. The playback has an Aspect Ratio of 1.77:1 (Fills the screen on my LG HD big screen TV) and the total run time of the complete season is 4 hours and 46minutes (Not counting the Bonus Extras). The episodes of Archer is rated TV MA – LSV so use your parental discretion when allowing immature children to view the programming. For those who just can't get enough Archer, the new season starts on January 19, 2012 at 10:00 PM Eastern on Cable station FX. Download Archer: The Complete Season Two from the iTunes Store in Digial HD.